SJ49 Friendship Singapore Tour 2015 by Mr. Yoichi Takahashi, the creator of ‘Captain Tsubasa’, took place from 12th November to 14th November 2015. During this 3 days’ tour, various charity events were organized and a sum of S$6000 was raised. 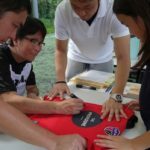 The contributions were mainly done by the Japanese football community in Singapore. The amount was donated to the Singapore’s Cerebral Palsy football team. On the first day of the tour, Mr. Takahashi was the guest of honour at the annual Japanese Community Football Tournament. Around 2000 Japanese people attended this tournament. Mr. Takahashi signed autographs for the children gathered at the event for about 2 hours and collected the donations. He also presented the awards at the tournament award ceremony which brought smiles on the faces of all the parents and the children. 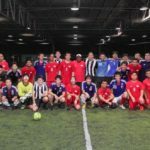 In the evening, Mr. Takahashi participated in the match played against Singapore Cerebral Palsy football team, at a nearby futsal pitch where the Japanese and the Singaporean media people were also present. On the 2nd day, a round table discussion event was held for the Japanese and the Singaporean media. 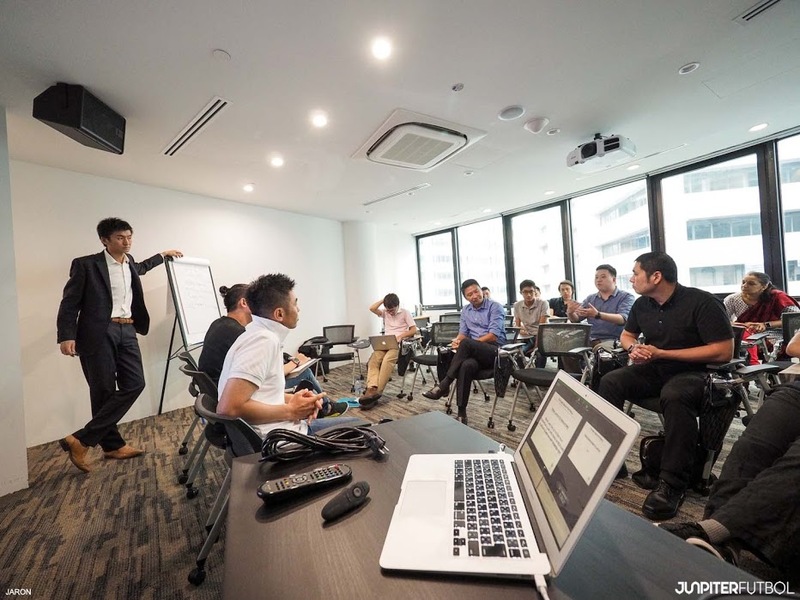 In continuation with the discussion from last year’s round table discussion, even at this event, there was an enthusiastic discussion about how to bring Singapore and Japan closer through football. Details of this round table discussion will be posted in a separate column soon. 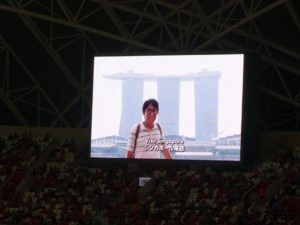 At the same event, the manager of Singapore CP football team gave information about his team. Various questions were also asked to Mr. Takahashi attending the event. After the round table discussion, a Talk Show was organized at the Japanese Association of Singapore, which is celebrating its 100 years of establishment in Singapore. The Talk show took place in the form of panel discussion with Mr. Takahashi as the guest and Mr. Kentaro Yomo of Institute of Future Asian Football as the moderator. 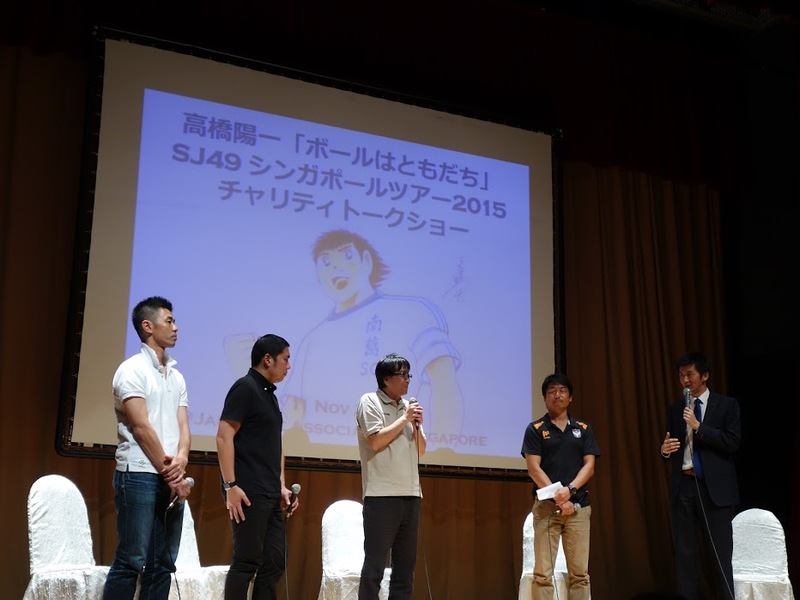 Mr. Yoshihiro Iwamoto, the executive chief editor of of Soccer King, Mr. Shujiro Namba of Albirex Niigata Singapore, and Mr. Taiichiro Saito of Global Football Academy (GFA) also participated in the talk show. After the talk show, there was one more autograph session and more donations were collected. On the 3rd day, Mr. Takahashi visited the local college of Arts before going to the stadium to watch the qualifier match between Singapore and Japan. At the football shop in the stadium, Mr. Takahashi had one more autograph session where many football fans queued up to get the Tsubasa illustration signed by Mr. Takahashi. 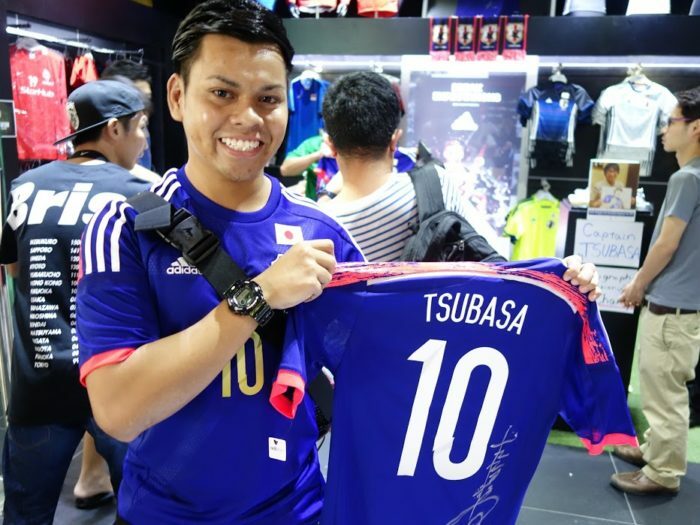 At this autograph session not just Japanese but Singaporean football fans also contributed to the donations. Simultaneously with this tour, an online auction was held in Japan and Hong Kong. 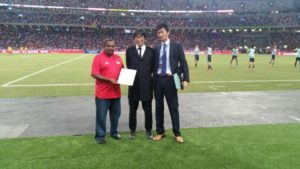 The proceeds of the two auctions and also the amount gathered at the Singapore tour was donated to the Singapore disabled football team. 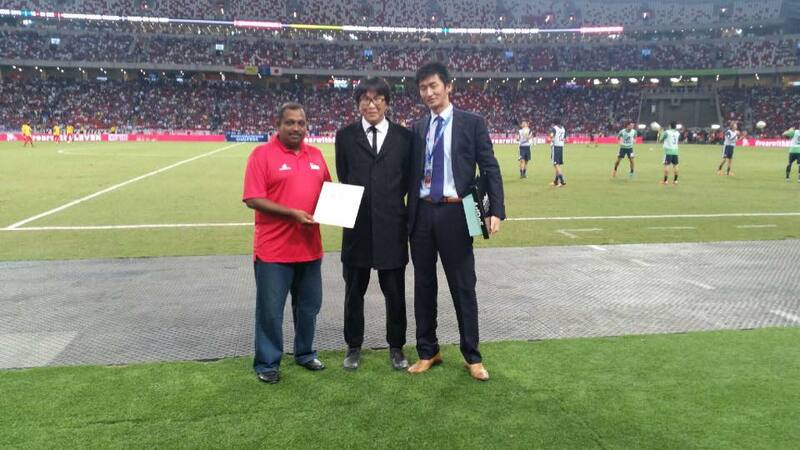 The cheque presentation ceremony took place during the half time of the Singapore – Japan qualifier match. The ceremony was displayed on the giant screen in the stadium and viewed by the huge audience. This team which is called the Cerebral Palsy team, with be participating in the ASEAN Para Games that will also be held in Singapore in this December. 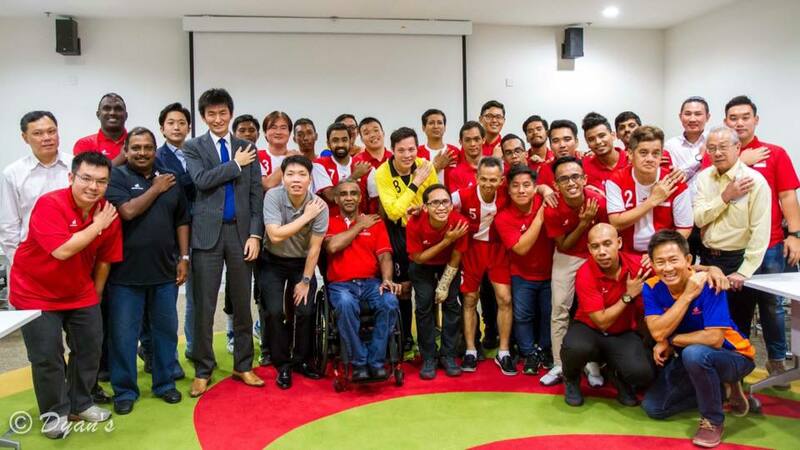 The Singapore Football Association for Disabled Players Expressed Their Gratitude.